When a developer decides to build anything from a sidewalk to a storm water catchment system, standard details exist to show them the way a city wants the work to be done. These engineering guidelines protect residents from unsafe practices that could damage property or affect quality of life. They also make these designers' jobs much more streamlined. So much goes into a single commercial building that any guidance is helpful and frankly necessary to keep the work load doable. The water purveyors in Roswell, GA recently updated their backflow prevention standard details to include new drawings for above ground rpz backflow preventers to continue supporting their engineers and protect their water supply. From May 2014 to April 2016, Safe-T-Cover conducted lunch and learns across the country on backflow preventer installation and best practices. It covers valve types, installation options, and the issues existing in our current cross connection control practices. During those two years, we collected responses from the water managers and engineers we had presented to. The questions focused around how helpful the presentation was, of course, as well as how these engineers felt about their municipality's standard details. You can see the results of this survey of 1,222 professionals to the right. As you can see, the industry is looking for some change and added guidance. 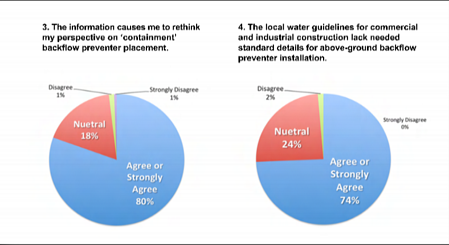 74.3% of those who answered the survey agreed or strongly agreed that, "The local water guidelines for commercial and industrial construction lack needed standard details for above-ground backflow preventer installation." Municipalities are listening to this call for change and are working to improve and expand their library of standard details. Roswell is just the most recent area to publish their new rpz backflow preventer details. We've previously assisted Arlington, TX in doing so and are working with others as well. Watch the webinar on backflow installation best practices and learn how you can update your standard details. Engineers need design standards to help them properly design and specify the best devices and methods for the public water system. Many of the standard details haven't been updated in years or decades. Because they are outdated, many don't align with the currently recognized best practices endorsed by leading trade groups such as the American Waterworks Association and the American Society of Plumbing Engineers. Within water districts and city governments, their roles are centered on asset management, resource-delivery, and customer service. They are often understaffed and simply don't have the time to think through all the necessary facets of new standard details, let alone time to push them through all the channels and have them published. That's why Safe-T-Cover works with water municipalities, like Roswell and Arlington, to help produce new details. Every water district that benefits from this service is a win for clean drinking water. The Clean Water Act of 1972 started a slow but steady march to a more robust system of cross connection control when it's author, the Environmental Protection Agency (EPA) published its initial Cross-connection control manual (CCCM) in 1976. With revisions through 2006, it now exists as the preeminent guide on the protection of the public water system from private water customers. The language within it clearly states that the municipality must ensure that no drinking water return to the public water supply. Updated standard details help water districts and, therefore, engineers in that district comply with these rules.